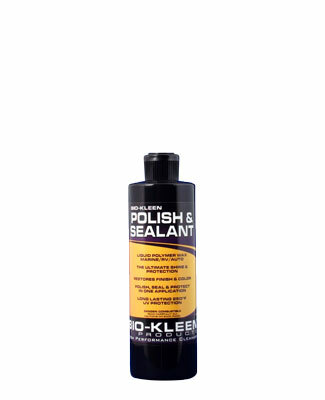 Bio-Kleen Polish & Sealant is a Liquid Wax Polish for Boats, RVs and Automobiles. This deep cleaning marine polish removes dullness and enriches color. A unique, non-abrasive boat wax that bonds itself to the finish of your boat, RV or vehicle and creates a tough, slick protective shield against salt, acid rain, bird hits, tree sap, bug residue and UV rays. Long lasting 250?F UV Protection. The polymer sealant gives paint and fiberglass a high degree of detergent resistance while still maintaining a breathable surface. Use your boat day-in and day-out and still maintain excellent shine and protection. Apply to the exterior windshield ? water beads up and rolls off. Easy On / Easy Off ? Deep Cleans ? Restores Color ? Polishes and Seals all in one application. Will Not Damage Vinyl Decals. Also excellent for household use on non-porous surfaces such as: shower doors and tiles, mirrors, windshields, sinks, chrome and more.